At the airport, I picked up a copy of The Wildings, because it was shiny (and also coz I read a couple of tweets from @dpanjana mentioning it), but mostly coz it was shiny. The Marwari in me was thrilled. 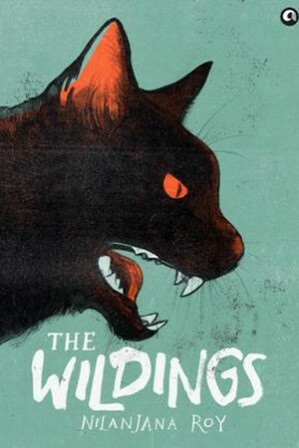 The Wildings is about a band of cats that lives in the Nizamuddin neighborhood of Old Delhi. The themes are familiar, good vs. evil, nature vs. nurture but the narrative is completely unique. Human beings are relegated to side characters in their own ecosystem, called “Bigfoot” by the cats. Roy has done the research, as far as animal behavior is concerned and laid out an intimate, playful, and empathetic story about a world that exists three feet off the ground. From the Mongoose named Kirri, to the mynahs named Sa, Re, Ga, Ma, Pa, Dha, and Ni- the extent of Roy’s knowledge is evident. My favorite lines from the book demonstrate this amply. Apart from the aforementioned shiny cover, this book also has illustrations by Prabha Mallya, pictures made in ink that seem alive on a page. To me, it almost broke the fourth wall, I felt like I was being made privy to a secret world of these animals, as a vine curled out of the edge of a page or a Tooth, the dangerous yet brave cheel flew out at me from the center of the page in a particularly dramatic scene. But as we seem to be hearing so much these days, (Star World’s programming head, Rasika Tyagi also mentioned in a recent interview with Mumbai Boss), it’s all about finding a connect with the characters. (Apparently that’s why Meredith and what would Meredith do? and what would Meredith wear? and who would Meredith do? is coming out of our ears.) Roy, manages to nail the connect between character and reader. She fires sure shot after sure shot, with her gun firmly on the shoulders of her furry protagonists. They are compelling and as real as a character that’s not human can be. The Wildings also reminds us that we at the end of the day are animals. Are we the animals that follow the ethics of mother nature, (when to kill a prey, when to let it go, and how to defend yourself). Or are we creatures drunk on our own evolutionary advantages that want to annihilate everything in our paths just because we can? That is the question. My only problem with it might have been that there were too many characters to keep track of, but seeing as how the book ended like there was a sequel in the making and writer Nilanjana Roy promised that she would make it more streamlined, giving us more in depth knowledge of her characters, I cannot wait for the second book of The Wildings. I watched Moonrise Kingdom on recommendation from Anupama Chopra on Front Row with Anupama Chopra on Star World. I like her, she’s very pretty and smart, only the monotone delivery and her somewhat blank smile, I find unnerving sometimes. Having walked in a bit late into the theater, I missed the set up, but the film left me spell bound. Moonrise Kingdom is set in a fictional island, in a fictional time, and is the story of two children who fall in love and decide to run away. The film follows their journey through the island. I’m a little ashamed to admit it, but this is the first Wes Anderson film I’ve watched. I’ve followed all his commercials well enough, but for some reason never got around to watching a whole film, so I cannot comment on the Wes-Anderson-ny-ness of the film. Rest assured, I will be watching all his remaining films when the opportunity presents itself. Again, in terms of characters, Jared Gilbert as Sam and Kara Hayward as Suzy are spectacular. In spite of the oddly fairy-tale-ish and disjointed nature of the reality in the film, the characters are breathtakingly real. Gilbert and Haward deliver performances that are nuanced and adult. The adults in Moonrise Kingdom on the other hand, are one-dimensional, almost caricatures of themselves, but that also serves to elevate the love story of Sam and Suzy (two children) to poetic levels in a world of adults. Much like The Wildings, in Moonrise Kingdom, reality is a quirky element of the story. Also, the soundtrack of Moonrise Kingdom is superlative. Tying neat little knots at the end of every single thread at the end of the story. My personal favorite has GOT to be Francoise Hardy’s Le Temps De L’amour. Moonrise Kingdom and The Wildings serve to remind us that some times the most interesting stories come from the every where but in our own real world. Sita Sings The Blues (A modern day Sitayan)STUDENT OF THE YEAR: Pass aur fail, lekin class jaana zaroor.